Bottom rigs are easy to tie. All it takes is one knot. Once you have that one knot you can tie them about any way you want them. Single hook drooper, double hook drooper, long. short, tall, multi hook, you will be able to tie them all. 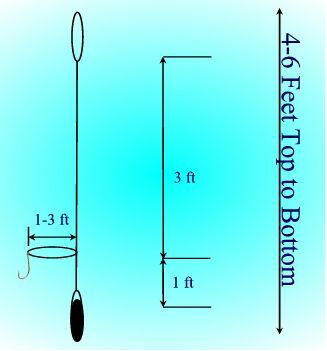 The rig that I am tying here are made for offshore bottom fishing if it bites offshore on the bottom it will hit this rig. 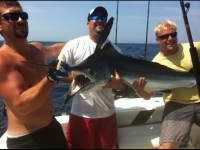 This same type of rig can be changed to inshore Catfish fishing just by using a lighter line and smaller hooks. I will be tying this out of heavy lines so it will be easier to see. Ok, so let tie a bottom rig. I use 80 lb mono line but here I am using string so that it shows up a little better. I think 200 lb mono ties easy and the knots still slip into place much nicer than if you move to the 100lb class or higher. Let's start by pulling a piece of the spool about 6-7 feet long. Now double back on the bitter end by about 12 inches and tie a simple overhand knot. Pass the end of the loop through two separate times. I might suggest that you put one of the three ends in your mouth and pull all three ends at once. this will make the knot nice and uniform and will keep it from wanting to slip badly when it the water. What you just tied is the basis of bottom rig tying. There are a couple of other ways to do this but this way is as easy as it gets. The knot that you just tied is either the top knot that will hold the end of your line or it is the end with the weight. Drop about 1 foot from the first knot and tie another one. Now you should have a line with 2 loops in it tied in a knot. Drop about 2 feet from the second knot and tie a third. Stop here and you have a Single Hook bottom rig. Drop 1 foot from the third knot and tie a forth. 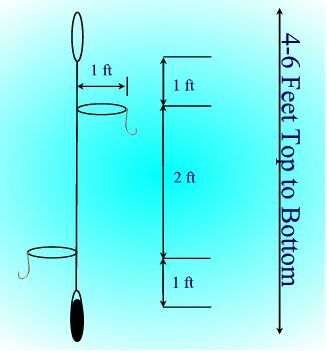 So now you should have 4 knots total and you will have a double bottom hook rig. Insert the end of the loop through your hook eye and around the shank. Same trick works with the weight. All done. Told ya that was easy.